Here is the latest update on my MOC: On Saturday I made building instructions (which I knew everyone would want) and now I am just waiting for the parts to come in the mail, hopefully they come sometime this week. 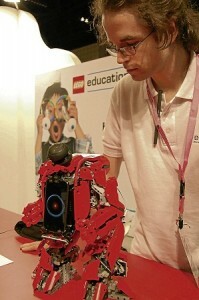 I found this photo of Daniele Benedettelli's "Cyclops" that he displayed at the World Robot Olympiad. It supposedly has voice and face recognition and interacts with humans. Hopefully he will post some more about it soon!! !